The new Church of Scientology National Affairs Office opened its doors in Dublin, Saturday, October 15, on the city’s iconic Merrion Square. The facility is designed to offer permanent delivery of Scientology-supported social betterment programs in Ireland. On Saturday, October 15, Church executives and staff officially opened the new home of the Church of Scientology National Affairs Office for Ireland at No. 4 Merrion Square North. A festive ribbon-cutting and open house event marked the launch of the new Church of Scientology National Affairs Office for Ireland. Visitors tour the Information Center during the Open House held Saturday, October 15, at the Church of Scientology’s new National Affairs Office for Ireland. Open House attendees take in the surroundings of the historic Merrion Square building that is now home to the Church of Scientology National Affairs Office. National Affairs Office The Church of Scientology’s National Affairs Office of Ireland was modeled after the Church’s first National Affairs Office in Washington, D.C. Located at No. 4 Merrion Square North, the heritage building has been meticulously restored under historic preservation standards as the headquarters for the Church’s social betterment programs in Ireland. Entrance Hall An open door and the radiance of refracted light greet visitors as they step into the foyer of the new Church of Scientology National Affairs Office of Ireland. The Office is open to all who wish to share the Church’s dedication to human rights and social betterment programs within their communities. Reception Foyer The Reception Foyer is comfortably appointed to provide an atmosphere of peace and contemplation for visitors and Church members who come to participate and partner with the Church in its social and humanitarian outreach efforts. Information Center The Information Center taps into a wealth of material that explains how and why the Church of Scientology seeks to share its goals and methods of creating a better world, one free from war, crime, drugs, human rights abuses and other social ills. Merrion Parlour The Merrion Parlour offers a place where visitors can pause to relax, get acquainted, or simply sip a friendly cup of tea by the fireplace. The Wilson Room Within the elegant venue of its Wilson Room, the National Affairs Office provides a space and resources where community leaders and civic groups can form partnerships and together tackle social issues for the betterment of all Ireland. The historic No. 4 Merrion Square North is an example of some of Dublin’s finest Georgian architecture and dates back to the 1760s. The Church carefully restored and preserved the facility’s architectural features such as the interior granite and marble detailing. Liffey Hall Just as the River Liffey brings renewal to the environment around Dublin, so will the facilities of Liffey Hall offer up a place to explore spiritual and social renewal through opportunities to teach, learn and share information in a collaborative way. The patio provides provides a perfect place for visitors and staff alike on break from meetings, forums and seminars. Merrion Square The location of the National Affairs Office in this world-famous garden square near the heart of Dublin’s City Center reflects links to the city’s literary past and present. Scientology Founder L. Ron Hubbard once lived and worked only doors away from the facility’s home. Drug-Free World The Church’s decades-long fight to alleviate the human misery and economic consequences associated with drug abuse has led to one of the most successful, privately-funded and promoted anti-drug crusades in the world—one focused on prevention of drug use. These efforts towards a drug-free world have been built from the ground up to partner with police, educators and governments to bring “The Truth About Drugs” to those facing temptation. The National Affairs Office of Ireland is designed to engender collaboration with groups and individuals who share the goal of a drug-free Ireland. Human Rights The Church of Scientology’s support for the advancement and protection of human rights, has been strengthened by its creation of two potent nonprofit organizations—United for Human Rights and Youth for Human Rights—responsible for publishing and distributing over 60 million educational documents on the subject. The National Affairs Office of Ireland is designed to bring a similar message of respect and understanding to schools, teachers, government organizations and churches and to support the commitment of the Irish to the protection of human dignity for all people. The Way to Happiness L. Ron Hubbard authored The Way to Happiness, as an educational work that provides anyone with an easy-to-follow “road map” for living. The 21 precepts of The Way to Happiness offer a path to understanding why such values as being trustworthy, temperate, industrious, loyal to truth—and a role model for others—helps make the world a better place in which to live. The National Affairs Office of Ireland provides The Way to Happiness program for all who wish to utilize it in their areas, activities or organizations. Scientology Volunteer Ministers The nonprofit Scientology Volunteer Minister organization draws on volunteers from both inside and outside Scientology and was originally conceived as a way to help restore spiritual values. Doing so reinforces the vital connections between people affected by disaster—or by the failures of modern society to meet its humanitarian obligations. The National Affairs Office offers this vital program for social missions throughout Ireland, helping meet the needs of those for whom the yellow shirts of these volunteers are a sign of hope. Narconon One of the weapons in the war against drug addiction has been the establishment of Narconon, a Church-supported drug rehabilitation program that helps addicts escape the dangerous cycles of drug abuse. There are Narconon centers located throughout Europe, in the United Kingdom, and in numerous locations in the U.S., where they have delivered help for 50 years to those afflicted by addiction. DC National Office The National Affairs Office in Washington, D.C. was the first and only one of its kind until the creation of the National Affairs Office of Ireland in October 2016. The Washington, D.C. Office works towards a world that is more secure and just, and where freedom of conscience and tolerance for the beliefs of others are worthy goals. It seeks to help provide resources for interfaith cooperation and dialogue on humanitarian issues of importance to all. It is the Church’s intent that this mission be as effective in Ireland as it is in America. Over the centuries the nation of Ireland has served as a fountainhead of culture, poetry and art for Western Civilization. 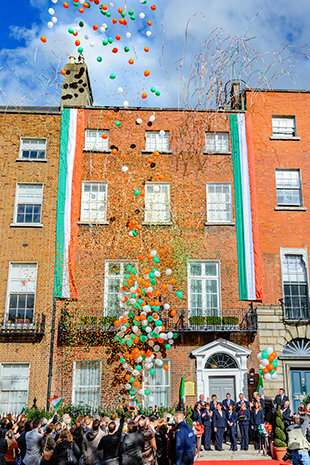 At the heart of that cultural outpouring is the City of Dublin and within its urban core stands a place whose history-soaked streets present a striking representation of it all—the majestic Merrion Square.